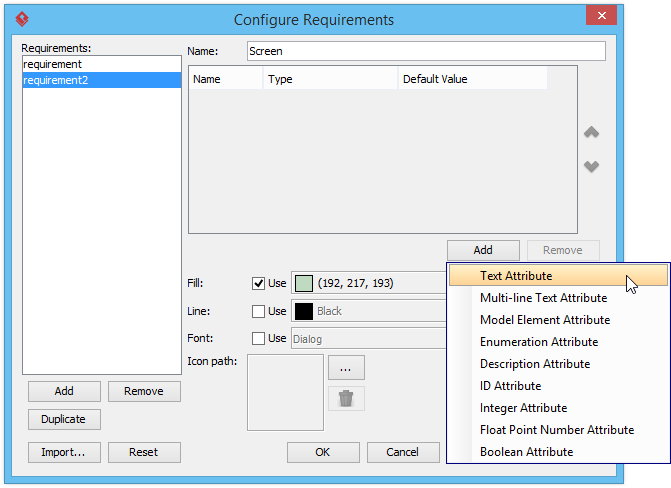 How to Customize SysML Requirement Types? Current: How to Customize SysML Requirement Types? When you need to record system requirements, both functional and non-functional, requirement modeling will be helpful. Through requirement modeling, requirements are recorded and presented visually as boxes, with a name that summarize the requirement and a set of attributes that define the requirement. The default requirement 'box' allows specifying general attributes like ID, source, kind, verify method, risk and status. You may, however, define your own requirement types that contain attributes related to your domain. Create a new project by selecting Project > New from the application toolbar. In the New Project window, enter Tutorial as project name and click Create Blank Project. We are going to create several requirements in this tutorial. Let's create a SysML requirement diagram first. 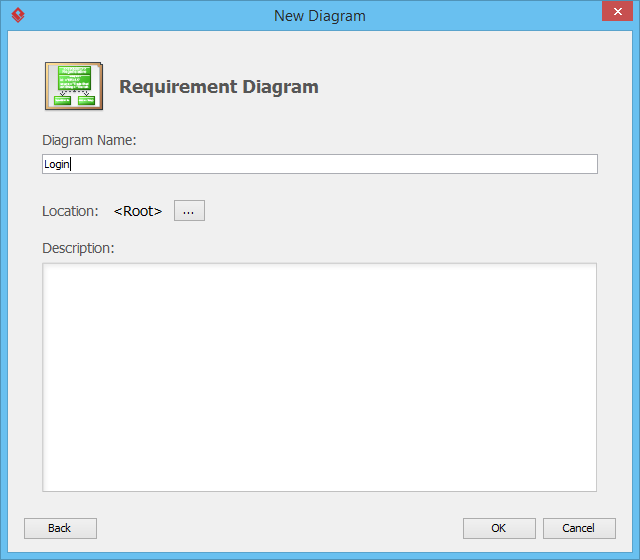 To create a requirement diagram, select Diagram > New from the application toolbar. 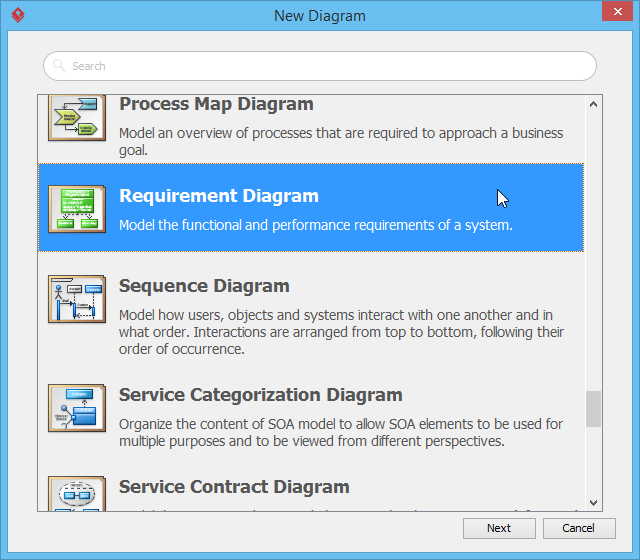 In the New Diagram window, select Requirement Diagram and click Next. Enter Login as diagram name and click OK.
On the left hand side of the diagram you can see the diagram toolbar, where you can pickup a tool like a Requirement, a Model or a Test Case and click on the diagram to create a shape. Normally you will make use of the Requirement tool to create requirements. But in this tutorial, we are going to define our own types first. 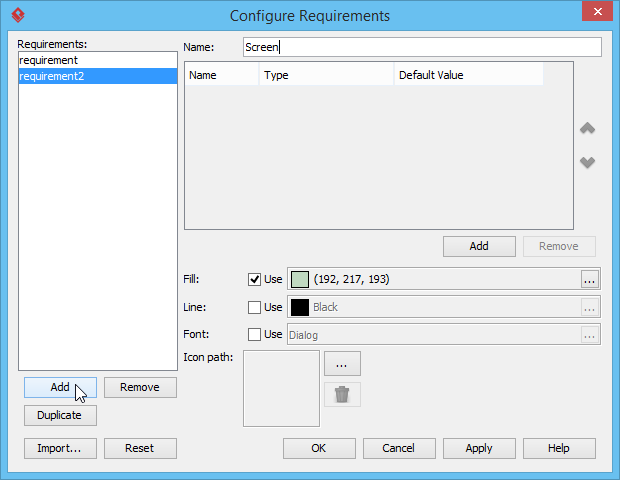 Select Window > Configuration > Configure Requirements... from the application toolbar. Screen A type of requirement which consists of properties about a screen design. Checking A type of requirement which consists of rules for validating input and the proper response to bad input. Create the Screen type first. Click Add at the bottom left of the Configure Requirements. Then, enter Screen as name. description Text A description of the screen being documented. screen-id Text A unique and internal value for identifying the screen being documented. allow-reset Enumeration Determine whether there is a Reset button for clearing fields on the screen. allow-cancel Enumeration Determine whether there is a Cancel button to close the screen without proceeding. We need to define those properties above. 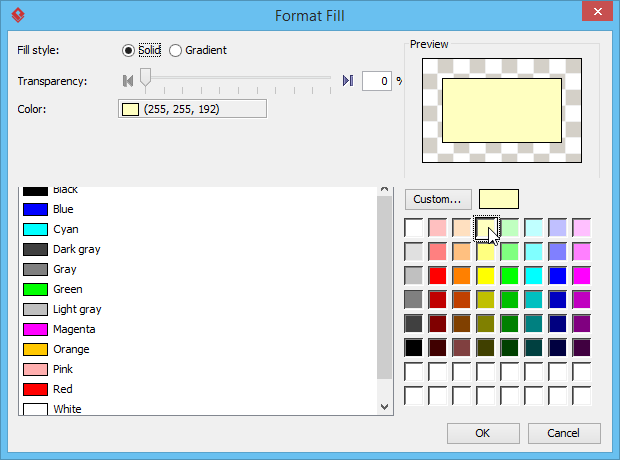 Click Add at the right hand side of the dialog box and select Text Attribute from the popup menu. Enter description as name. Repeatedly create the remaining properties. Make sure you have chosen Enumeration as the type of allow-reset and allow-cancel. In the Edit Enumeration window, click Add and enter yes. Click Add again and enter no. This creates the two allowed values, yes or no, for this attribute. Click OK to go back to requirement configuration. 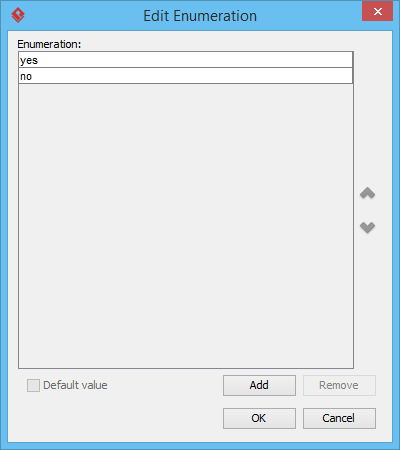 Similarly, add the enumeration values yes and no for the attribute allow-cancel. The four attributes are all added. Besides defining requirement attributes, you can also set the formatting properties like fill, line and font styles. These setting will affect how this type of requirement will look like in diagram. Let's try setting a different fill color. Click the ... button for Fill. In the Format Fill window, select yellow and click OK.
policy Enumeration Determine the action to take when a bad input is detected upon checking. We may allow user to try again, or just cancel the action immediately. allowed-attempts Integer The number of attempt user can make. 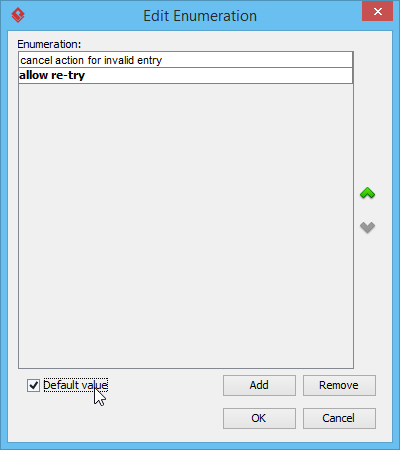 Add the enumeration values cancel action for invalid entry and allow re-try for the attribute policy. In most checking, we allow user to try again. Therefore, select allow re-try and check Default value at the bottom. Therefore, set allow re-try as the default value. This will cause allow re-try be selected when you create a <<Checking>> requirement. 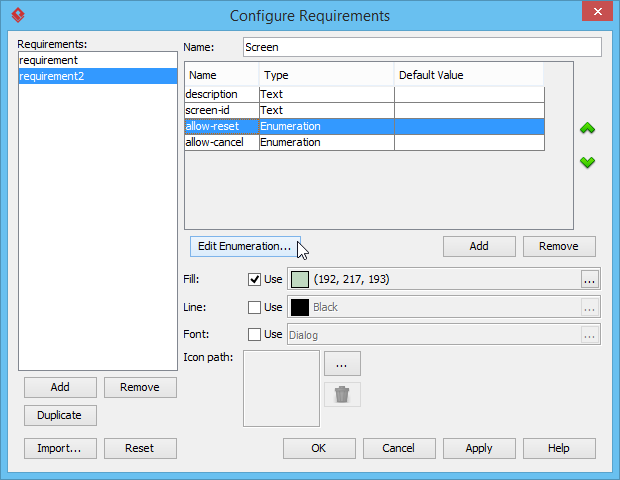 Requirement types are configured. Click OK to return to requirements configuration. Click OK again to confirm all the changes and return to the diagram. Now comes the final attribute - allowed attempts. It is an attribute that requires a numeric input. Therefore, click Add and select Integer Attribute. Enter allowed attempts as name. We can now create requirements with the new types. 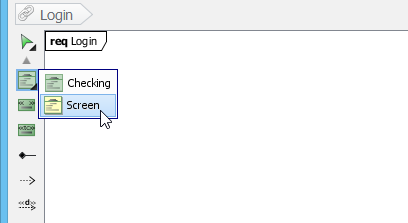 In the diagram toolbar, press on the tool Requirement and select Screen. Double click on the attribute description and enter Provide a page for user to login to the system as description. Similarly, double click on screen-id and enter UI-001. Remember allow-reset and allow-cancel are enumeration attribute? 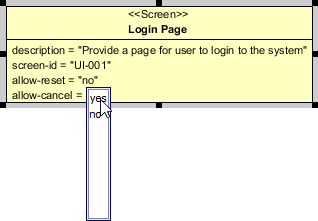 Double click on allow-reset, you can see that the value is restricted to either yes or no, as defined. Select no for allow-reset and yes for allow-cancel. Now, make use of type Checking to specify a requirement for validating form input. Press on requirement type Screen in the diagram toolbar and select Checking. Click on diagram to create a requirement. Name it as Form Field Checking. Double click on attribute description and enter When submit, warn if either or both user name and password fields are empty. It is fine to let user re-enter the correct email address. Therefore, just keep the policy as allow re-try. Leave allowed-attempts empty to indicate that there is no restriction on the number of attempts.